An English Treeless Saddle for your Horse that sits perfectly well on your horse back whether your horse has wide or narrow wither the saddle can be adjusted accordingly being treeless. - Made from fine quality synthetic Suede material. making it comfortable for your horse. 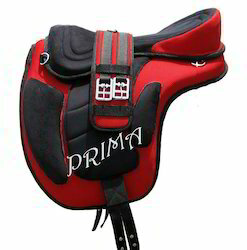 - Saddle has padded and deep seat and provides comfortable ride for the rider. 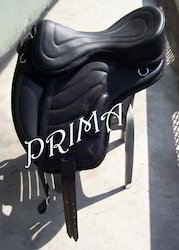 - Saddle is very light weight (weighs less than 4kgs) and offers comfort to both rider and horse. - Saddle has Detachable seat with velcro system. - PU molded seat and flaps, no hard components. 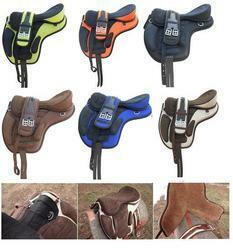 - Soft and washable synthetic suede saddle. Size Available - 16", 17", 18"
Color available - Black, Brown, Red/Black, Blue/Black, Beige/Brown, Black/Orange, Grey/Black, Purple/Black, Pink/Black. - All our saddle comes with good quality workmenship. - We have our inhouse manufacturing facility. - We are manufacturers and exporters of complete equestrian range. - All our product have Made in India Tag. - Quality control and regular checks makes are product ahead of our competitors. Please contact us all your trade enquiries. 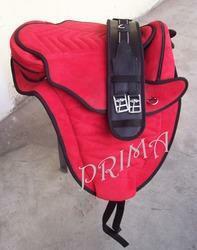 - This Treeless Freemax saddle is made from fine quality synthetic Suede material. - Developed on flexible tree this Treeless saddle adjusts on horse back and exerts no pressure on horse thus making it comfortable for your horse. horse thus making it comfortable for your horse. 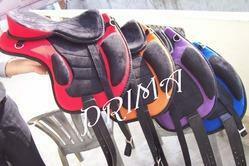 - Saddle is very light weight (weighs less than 3kgs) and offers comfort to both rider and horse. - We offer competitve and Best price in the Industry. We welcome all your trade related enquiries. An English Leather Treeless Saddle for your Horse that sits perfectly well on your horse back whether your horse has wide or narrow wither the saddle can be adjusted accordingly being treeless. - Developed on flexible PU tree this Treeless saddle adjusts on horse back and exerts no pressure on horse thus making it comfortable for your horse. - Saddle has padded and deep seat which provides comfortable ride for the rider. - It has an adjustable gullet system so that single saddle can be used on horse with low to high withers. adjustment to the rider. The saddle can be used with and without panels. - Size available - 16"/17"/18"
- FREE : Matching Leather Girth and Stirrup Leather. An English Treeless Saddle for your Horse that sits perfectly well on your horse back. and saddle can be easily transported and cleaned.